DesktopAppInfo is an implementation of AppInfo based on desktop files. Creates a new DesktopAppInfo based on a desktop file id. A desktop file id is the basename of the desktop file, including the .desktop extension. GIO is looking for a desktop file with this name in the applications subdirectories of the XDG data directories (i.e. the directories specified in the XDG_DATA_HOME and XDG_DATA_DIRS environment variables). 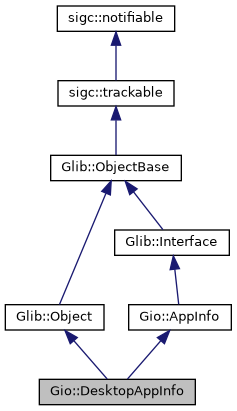 GIO also supports the prefix-to-subdirectory mapping that is described in the Menu Spec (i.e. a desktop id of kde-foo.desktop will match /usr/share/applications/kde/foo.desktop). desktop_id The desktop file id. A new DesktopAppInfo, or nullptr if no desktop file with that id exists. filename The path of a desktop file, in the GLib filename encoding. A new DesktopAppInfo or nullptr on error. Gets the user-visible display name of the "additional application action" specified by action_name. This corresponds to the "Name" key within the keyfile group for the action. action_name The name of the action as from g_desktop_app_info_list_actions(). Looks up a boolean value in the keyfile backing info. The key is looked up in the "Desktop Entry" group. The boolean value, or false if the key is not found. Gets the categories from the desktop file. The unparsed Categories key from the desktop file; i.e. no attempt is made to split it by ';' or validate it. When info was created from a known filename, return it. In some situations such as the DesktopAppInfo returned from g_desktop_app_info_new_from_keyfile(), this function will return nullptr. The full path to the file for info, or nullptr if not known. Gets the generic name from the destkop file. The value of the GenericName key. Gets the keywords from the desktop file. The value of the Keywords key. Looks up a localized string value in the keyfile backing info translated to the current locale. A newly allocated string, or nullptr if the key is not found. Gets the value of the NoDisplay key, which helps determine if the application info should be shown in menus. The value of the NoDisplay key. Checks if the application info should be shown in menus that list available applications for a specific name of the desktop, based on the OnlyShowIn and NotShowIn keys. desktop_env should typically be given as nullptr, in which case the XDG_CURRENT_DESKTOP environment variable is consulted. If you want to override the default mechanism then you may specify desktop_env, but this is not recommended. Note that g_app_info_should_show() for info will include this check (with nullptr for desktop_env) as well as additional checks. desktop_env A string specifying a desktop name. true if the info should be shown in desktop_env according to the OnlyShowIn and NotShowIn keys, false otherwise. Retrieves the StartupWMClass field from info. This represents the WM_CLASS property of the main window of the application, if launched through info. The startup WM class, or nullptr if none is set in the desktop file. Looks up a string value in the keyfile backing info. Returns whether key exists in the "Desktop Entry" group of the keyfile backing info. A desktop file is hidden if the Hidden key in it is set to True. true if hidden, false otherwise. Activates the named application action. You may only call this function on action names that were returned from g_desktop_app_info_list_actions(). Note that if the main entry of the desktop file indicates that the application supports startup notification, and launch_context is non-nullptr, then startup notification will be used when activating the action (and as such, invocation of the action on the receiving side must signal the end of startup notification when it is completed). This is the expected behaviour of applications declaring additional actions, as per the desktop file specification. As with g_app_info_launch() there is no way to detect failures that occur while using this function. Returns the list of "additional application actions" supported on the desktop file, as per the desktop file specification. As per the specification, this is the list of actions that are explicitly listed in the "Actions" key of the [Desktop Entry] group. A list of strings, always non-nullptr.